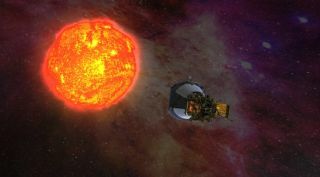 An artist’s illustration of NASA's Parker Solar Probe approaching the sun. In April of 1976, the German-American Helios 2 probe made spaceflight's closest-ever solar approach, cruising within 26.55 million miles (42.73 million kilometers) of the sun. But NASA's Parker Solar Probe zoomed inside that distance today (Oct. 29), crossing the threshold at about 1:04 p.m. EDT (1704 GMT), agency officials said. These records will fall again and again over the course of the Parker Solar Probe's $1.5 billion mission, which began Aug. 12 with a liftoff from Florida's Cape Canaveral Air Force Station. The spacecraft will study the sun during 24 close flybys over the next seven years, getting closer and closer to our star with each encounter. The Parker Solar Probe's final flyby, in 2025, will bring the craft within a mere 3.83 million miles (6.16 million km) of the sun's surface. And the sun's powerful gravity will eventually accelerate the probe to a top speed of around 430,000 mph (690,000 km/h), NASA officials have said. "It's been just 78 days since Parker Solar Probe launched, and we've now come closer to our star than any other spacecraft in history," mission project manager Andy Driesman, from the Johns Hopkins Applied Physics Laboratory in Laurel, Maryland, said in a statement. "It's a proud moment for the team, though we remain focused on our first solar encounter, which begins on Oct. 31." Those instruments will make a variety of measurements during the encounters. The Parker Solar Probe's observations will help researchers better understand the sun's structure, composition and activity, NASA officials have said. And the data could help solve two long-standing solar mysteries — why the sun's outer atmosphere, or corona, is so much hotter than the surface, and what accelerates the charged particles of the solar wind to such tremendous speeds. Mike Wall's book about the search for alien life, "Out There," will be published on Nov. 13 by Grand Central Publishing.Follow him on Twitter @michaeldwall. Follow us @Spacedotcom or Facebook. Originally published on Space.com.